ANS President Bob Coward (Right) presented PNNL Director Steven Ashby (Left) with the ANS Nuclear Historic Landmark Award for the over sixty years of work performed at the Radiochemical Processing Laboratory. 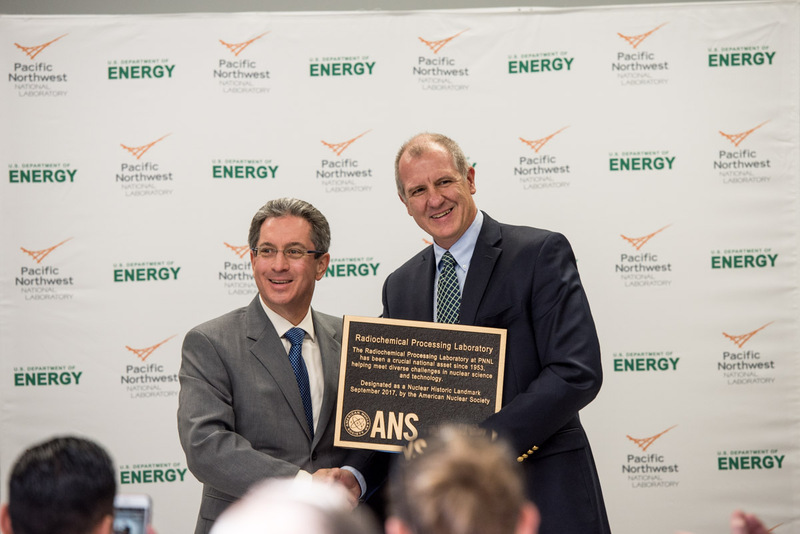 The Radiochemical Processing Laboratory of the Pacific Northwest National Laboratory in Richland, Washington, received the ANS Nuclear Historic Landmark Award on November 27. RICHLAND, Wash. — The American Nuclear Society honored the Department of Energy's Pacific Northwest National Laboratory's Radiochemical Processing Laboratory with the ANS Nuclear Historic Landmark Award for its notable research and work in the areas of reactor safety, isotope isolation to cure cancer, environmental cleanup, and the advancement of nuclear nonproliferation. The dedication took place on November 27 at the facility in south-central Washington State. "The world-class research performed at the Radiochemical Processing Laboratory is profound and continues to serve our nation today in nuclear energy and our national security as the only radionuclide laboratory in the United States certified by the International Monitoring System of the Comprehensive Nuclear Test-Ban Treaty Organization," ANS President Bob Coward said. The work of the RPL began more than 60 years ago and has been the center of many important operations and world-class research. It is a Department of Energy Hazard Category II Non-Reactor Facility. Recently, the Department of Homeland Security partnered with PNNL to create a plutonium oxide processing line at RPL for nuclear forensics. "The RPL is a unique facility with nuclear science and engineering capabilities critical to environmental cleanup, nuclear monitoring and forensics, and basic science," said PNNL Director Steven Ashby. "The nation has invested in its modernization, ensuring that it will continue to serve future needs. For instance, DOE recently installed a system that can process radioactive waste samples in support of long-term storage of Hanford tank waste." The American Nuclear Society established the National Historic Landmark Award 32 years ago to commemorate nuclear facilities that have demonstrated outstanding accomplishments, which were instrumental in the advancement and implementation of nuclear technology and the peaceful use of nuclear energy.